Chicago Mayor Rahm Emanuel joined Illinois Tech President John L. Anderson today to announce that John Ronan Architects and Shepley Bulfinch will design the planned Ed Kaplan Family Institute for Innovation and Tech Entrepreneurship on the University’s Main Campus in Bronzeville. John Ronan Architects, a Chicago-based, internationally recognized architecture and urban design firm, is the design architect. Boston-based Shepley Bulfinch is the programming architect on the project. Construction on the $40 million, 100,000-square-foot facility could begin as early as Summer 2015 with a completion date anticipated in 2017. The new facility will be located on Illinois Tech’s Main Campus, which was designed by Ludwig Mies Van Der Rohe; the specific site has not been determined. Ed Kaplan, an IIT alumnus and long-time member of the University’s Board of Trustees, along with his wife, Carol, made a gift of $10 million to establish the Institute. With a focus on innovative thinking and transitioning new ideas into products and processes, the Kaplan Institute will house workshops, media labs, classrooms, collaborative spaces, and offices for the University’s internationally-renowned Institute of Design, Idea Shop, and Entrepreneurship and Leadership Academies. Kaplan, a Chicagoan who earned his bachelor’s degree in Mechanical Engineering from IIT in 1965, co-founded Zebra Technologies, a global leader in bar code technology. 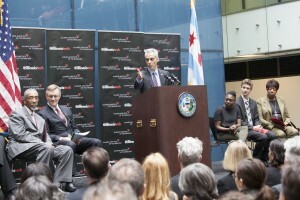 “IIT will be transformed into a center of technical innovation in Chicago, says Kaplan. “The Center will help grow the tech-ecosystem here in Chicago and be a catalyst for innovation.” Kaplan’s $10 million gift is a challenge grant and is in addition to the $1 million he had previously given to support this initiative. John Ronan, founder of John Ronan Architects, will lead the design of the new facility. Founded in 1999, John Ronan Architects rose to national prominence in 2004 with the winning design for the 500,000-square-foot Perth Amboy High School in New Jersey. The firm has been the recipient of two AIA Institute National Honor Awards—for the Gary Comer Youth Center and the Poetry Foundation, both in Chicago—and was recently ranked #3 in the nation by Architect Magazine. In 2010, Princeton Architectural Press published a monograph entitled, Explorations: The Architecture of John Ronan, andthe firm’s work has been exhibited internationally, including in Iterations: John Ronan’s Poetry Foundation, an exhibition at the Art Institute of Chicago that runs through March 2014. “The aspirations for this project are nothing less than to transform the way in which students are educated at IIT to meet the challenges and opportunities of the future. I am honored to play a role in this process and I look forward to the journey ahead,” Ronan said. Shepley Bulfinch, the award-winning programming architect for the Institute, is a national leader in the programming and planning of prototype collaboration spaces for some of the country’s leading academic institutions, including the Harvard Innovation Lab; Duke University’s Link Teaching and Learning Center; and collaborative engineering and learning environments for Johns Hopkins University. The firm has strong ties to Chicago that date back to 1892 when the firm (then Shepley Rutan & Coolidge) designed the Art Institute of Chicago as part of the World’s Columbian Exposition.